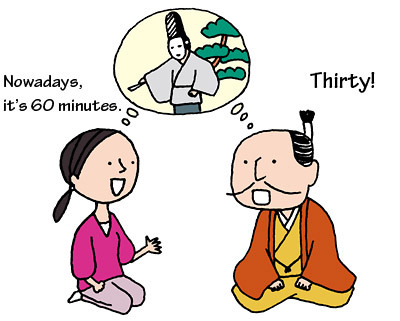 TRIVIA of Noh : Q94 : Is the running time for a Noh play today the same it was in olden times? | Home | Trivia | Q94 : Is the running time for a Noh play today the same it was in olden times? Is the running time for a Noh play today the same it was in olden times? In the busy contemporary world, people prefer efficiency and briefness. In the world of entertainment, we hear many up-tempo new versions of old hit songs. On the other hand, the running times of Noh plays grow longer over time. According to records of performances and running times, Noh plays in the late Edo era ran for about nine-tenths of today's duration, while in the middle of Muromachi period they took about half as long (from studies by Prof. Omote Akira). It is believed that this is because the pace, rather than the content, has changed over time. Classical plays came to need longer for descriptions of details, and running times doubled. In other words, modern people take more time to appreciate a Noh play than did those of the Muromachi period.